Should I Run If I'm Trying to Build Muscle? Many runners are body-conscious, wanting to look as toned and trim as they can. If you want to build muscle mass while continuing with your running routine, you may need to plan accordingly. Running may counteract strengthening activities depending on your metabolism and the distances you are running. Your metabolism is a complicated system of chemicals that turns calories into energy. Generally, athletes have fast metabolisms and burn calories from food more quickly than the average person, which means that there are not many available calories to be converted to energy for exercise. Not to be confused with your metabolism, the body creates the energy you need to sustain running through the aerobic pathway. The aerobic pathway converts calories into energy that you need to sustain your exercise. The calories are sourced not only from the food you eat but from stores of fat and muscle, which contain calories, in your body. Your muscles are metabolically active, meaning that they need calories to simply maintain their size and shape, and especially to grow bigger. Calories from food and fat may be easier to access and are generally preferred over calories from muscle. However, longer runs may start to burn calories from muscle if your body does not have many calorie stores of food and fat left, which can cause your muscles to shrink in size. 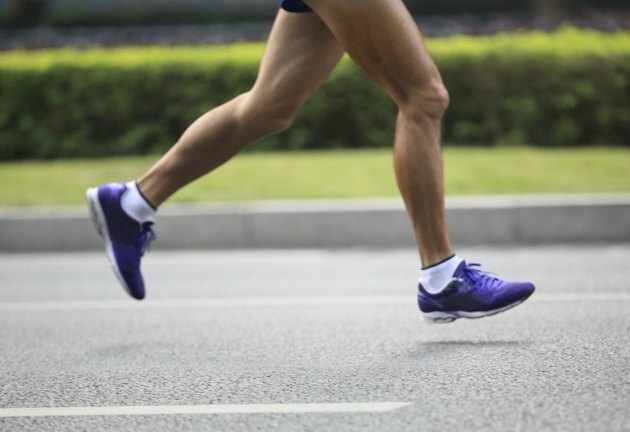 In addition to causing muscles to shrink if there is a caloric deficit, many trainers and athletes believe the body responds to long runs by shrinking muscle fibers to make them more efficient. While the obvious solution would be to lift more weights in addition to running, many athletes believe the body may negate the effects of additional weight training, known as the interference effect. However, 2012 Canadian and Swedish studies have shown that there was no change in muscle mass after completing an aerobic activity concurrent with strength training in the same exercise session. There are limitations of the studies, such as the fact that both only looked at immediate rather than long-term results, but these studies are the first to negate long-held beliefs that aerobic exercise done on the same day as strength training could shrink muscle mass. How Far Are You Going? As you can see if you look at the body compositions of sprinters and marathoners, some runners have large muscles while others do not have much. If you want to build muscle and run, you will need to adjust the distances you run. Doing so will promote muscle growth while still building your endurance through cardiovascular activity. Running shorter distances and continuing a safe weight-training regimen, along with proper diet and nutrition, may not impair your muscle-building efforts. The right distance is different for everyone, but keep in mind that longer distances burn far more calories and may start breaking down calories from muscle. Mueller Center: How Do Your Muscles Grow? SpeedEndurance.com: The Interference Effect: Can You Train Strength and Endurance Concurrently? Muscle for Life: Cardio and Muscle Growth: Friends or Foes? How Long Does Your Body Burn Calories For After a Workout? Does Running Make Your Thighs Bigger? Does Running 20 Minutes a Day Burn Fat? Can You Replace Body Fat With Muscle? How Long Will it Take to Get Ripped Doing Sprints? I'm Overweight: Can I Build Muscle?